Dear Rose is the new niche line of Chantal Roos* and her daughter Alexandra Roos. 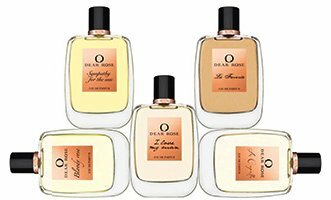 They debut in May with five fragrances developed by perfumer Fabrice Pellegrin: A Capella, Bloody Rose, I Love My Man, La Favorite and Sympathy for the Sun. A Capella ~ a fresh green floral; "A new day is calling us... the warm and bright rays of the early sun light up the room and give it a peaceful atmosphere. A light summer's breeze blows gently through the rose garden, passes lovely violets and mandarine leaves, caresses the ivy that covers the wall... all embraced by fresh bergamot and white woods. A fresh, green and flowery summer fragrance, tender and feminine." Bloody Rose ~ a woody floral gourmand; "A decison made with heart and mind, a decision for pure and sincere love. A promise to a very special person. It feels like the whole world is turning around us and happines floods us with infinite warmth... Like in a South Sea paradise, the scent of juicy oranges and lovely ylang ylang surrounds us. A bow is solved, a package opened - and we witness noble pralines with a scent of heavenly sweets. The earthy breath of patchouly comes from far away... a moment of pure happiness!" I Love My Man ~ a spicy woody floral; "Woooosh - the chord of an arch swings heavily, Amor's dart is approaching its target. Time seems to stand still. Tick - an incredible feeling - love at first sight - tack - we smell roses from Bulgaria and France. Tick - our legs are weak and it feels like walking on cotton wool. Tack - a breath of cinnamon, tonkabean and sandalwood reaches our nose. Tick - the heart beats faster. Tack - oh could this moment last forever..."
La Favorite ~ a spicy floriental; "It has been raining for days now, the city has melted to a single grey. The empty pages of the novel lie in front of me and refuse to fill... ...we look at the distance, and far away we see dunes and an endless desert. Finally we witness the walls of a mysterious city - an oasis of hope. The warm wind carries his oriental heart to us - we smell oud and patchouli. A carawan with noble spices passes - the scents of pink pepper, finest saffron and white musk ambrace our senses. The city is full of live, but suddenly we hear the sound of trumpets - a sedan is carried over, inside is princess Sheherazade... the rain has now disappeared, and the smell of roses fills the bright air.."
Sympathy for the Sun ~ a fresh floral; "Tenderly the ocean's waves roll on the beach. They carry her footprints like a memory and take them far away. Her long red hair is decorated with peonies, and she is gazing at a far point at the sea. From far away the salty breeze brings the scent of hesperides from faraway countries. Perhaps they still exist, those white spots on the maps? A small paradise waiting for those who will discover it? She dreams away. A breath of jasmine, oakmoss and bergamot carries her thoughts across the sea." Dear Rose A Capella, Bloody Rose, I Love My Man, La Favorite and Sympathy for the Sun are available for pre-order now at Essenza Nobile in Germany, €125 each for 100 ml Eau de Parfum. * Chantal Roos was the president and chief executive officer of YSL Beauté until 2007. She has also worked for InterParfums and Shiseido's BPI division, among others. Oh My! That’s one of the most “florid” copy I have ever read! It’s almost a parody of the genre! And is EVERYBODY coming out with multi-fragrance lines? It’s pretty amazing! And yes! I’m just hearing David Attenborough’s voice in my head.. I do kinda like Sympathy for the Sun as a name, though, even if the rest is ridiculous. I would have been happier if there were only 3 perfumes.